A fantasy world created by sparkling white snow! Enjoy the speed and freedom of skiing. Take skiing and snowboarding lessons offered in various languages and enjoy exciting performances and cultural experiences. In Korea, visitors can discover a whole new world of skiing through the Fun Ski Festival, the Go-Go Ski Festival, Viva Ski Festival, Korea Int’l Ski Camp. 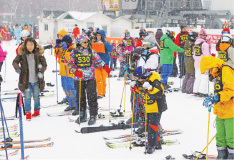 This ski festival is held from mid-December to early March at Yongpyong Resort, Korea's first ski resort and a wellknown host of international competitions. It offers a fun and exciting winter experience with skiing and snowboardding lessons taught by expert instructors, skiing competitions and award ceremonies, and a wide range of hands on programs and performances. This ski festival is held from the peak of winter in mid-December to early March at High1 Resort, which is equipped with top-notch facilities. It offers a memorable experience particularly to Southeast Asian tourists who love the excitement of skiing and snow. 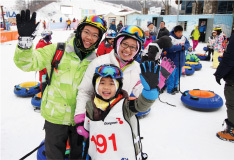 Visitors can take part in expert-taught skiing lessons of varying difficulty as well as performances and events to experience the beauty and charm of Korean culture. * The festival schedule is subject to change. For more details, please contact your nearest Korea Tourism Organization office.